If you had left Dijon this morning, the village and moorings of Fleurey sur Ouche gives you the a welcomed chance to moor up, sit back and relax. This is a very traditional village offering all the charm of France. There are many small streets to explore and some very old houses. The small and steep high street has the essential small shops for stocking up on supplies. 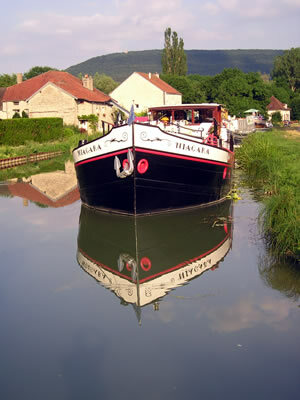 Moorings are good and calm, before or after the bridge in the centre of the village. Above lock 42, by the small road are bollards and good deep moorings. If you prefer more shade, move upstream the other side of the bridge, there are trees providing shade and you can use stakes. If you are continuing up the canal, then stock up here because you'll have to pass quite a few locks before you find any shops again. You'll have to wait until reaching La Bussiere or Dijon for fresh bread. In the village of Fleurey there is a bit of everything, with small friendly shops. Fruit, groceries, news agent, chemist and a fine typical French cafe. The duke "Robert le vieux" died in the village in 1076, his death remains quite a mystery as it is described as "Shameful" and tragic.